I appreciate pumpkin. I really do, but Christmas flavors are the cat’s meow. As soon as October comes around, I am already stocking up on eggnog. Any excuse is suitable. Got a paper cut? Eggnog will solve that. Tore your favorite pair of jeans should automatically guarantee a lifetime supply of eggnog. Â Gingerbread is good too. Combine the two? ‘Mazing. I pulled inspiration from my boozy eggnog marshmallow recipe from last year to create these gingerbread house s’mores. Yes, that’s right. Let me break it down for you: Gingerbread+eggnog+chocolate= a flavor that will confuse and awe you more than a celebrity meltdown. *SHORT CUT- You can use store bought marshmallow cream in place of the eggnog marshmallows to save time. It won’t taste the same though. Just sayin’. Cream the butter in a mixer. Add in brown sugar and mix, then eggs and molasses. 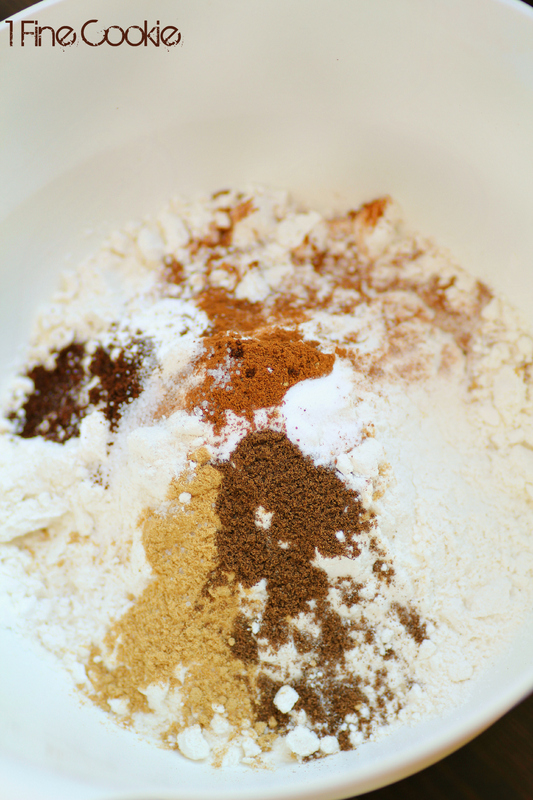 Mix dry ingredients together in a separate bowl then add to wet ingredients while mixing. Chill dough (wrapped in plastic wrap) for about thirty minutes to an hour. 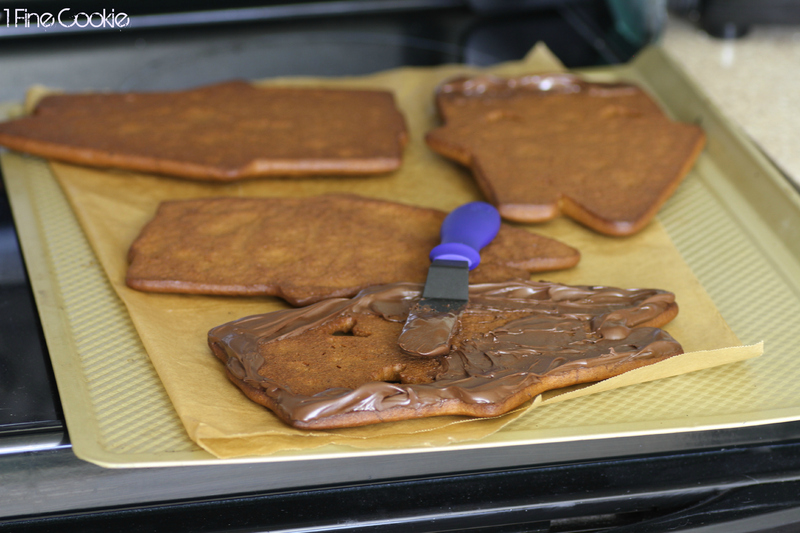 Roll out on parchment paper and use a house-shaped to cut out cookies. Â I chose a super large size but small ones are cute too. 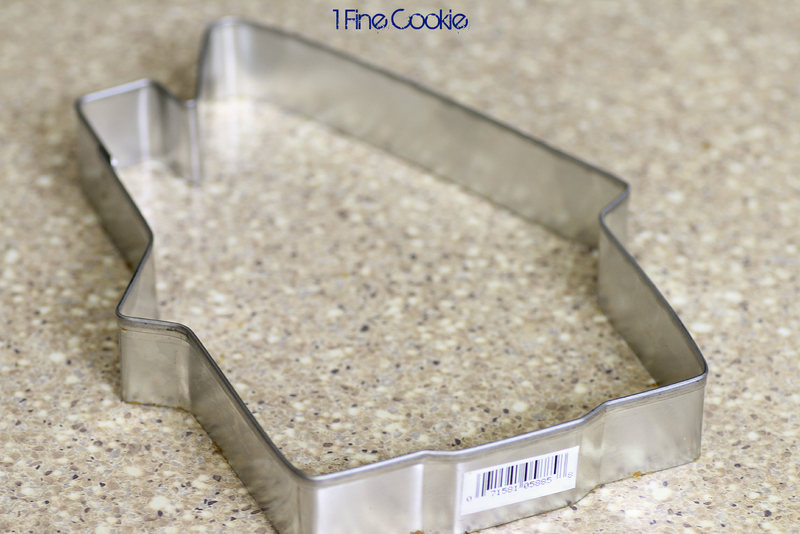 Make certain to flip half of the cookies so they will be able to form a sandwich. Bake at 350 degrees for 10-15 minutes depending on cookie size. Allow to cool and spread melted chocolate on one side. Set up your stations first. 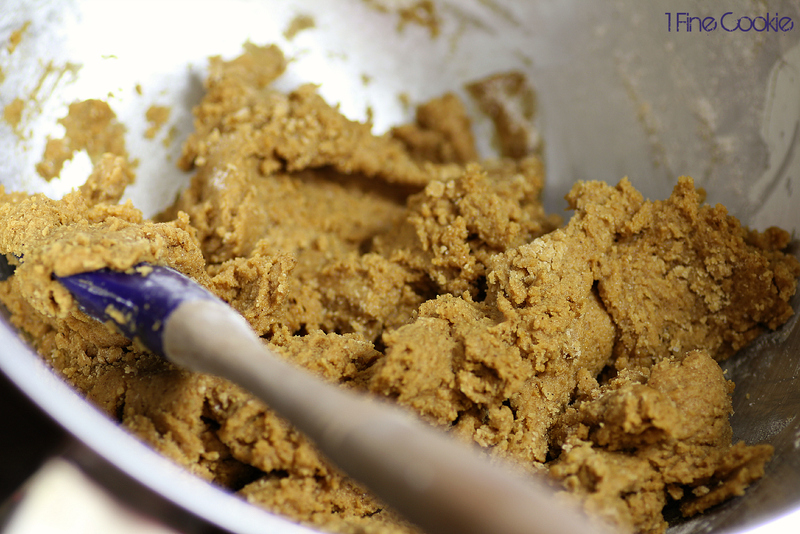 Sprinkle a packet of gelatin over the 5 tablespoons of cold water and 1 tablespoon cold eggnog into a mixing bowl. Allow it to soak up the liquid. 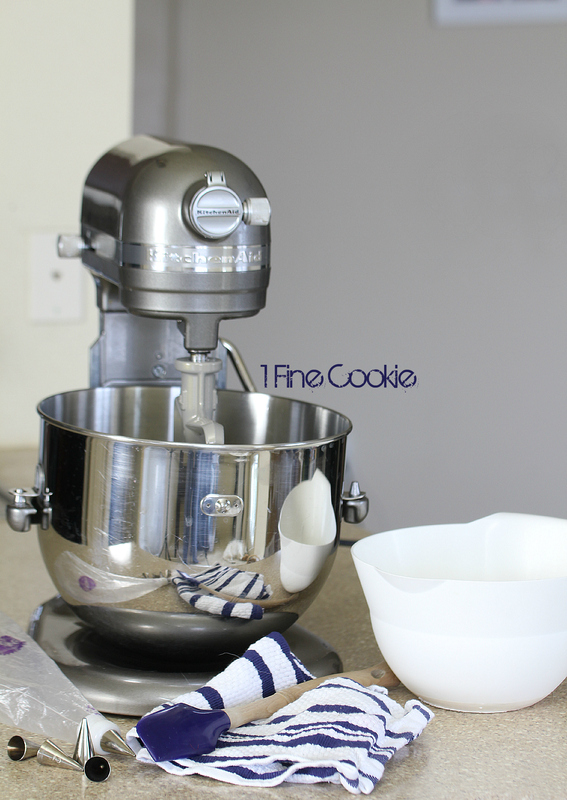 Set up a spatula, bowl, piping bag and piping tips next to the mixer. In the sauce pan pour 1/8 cup water over 1 cup sugar. Place heat on low and allow sugar to dissolve completely. 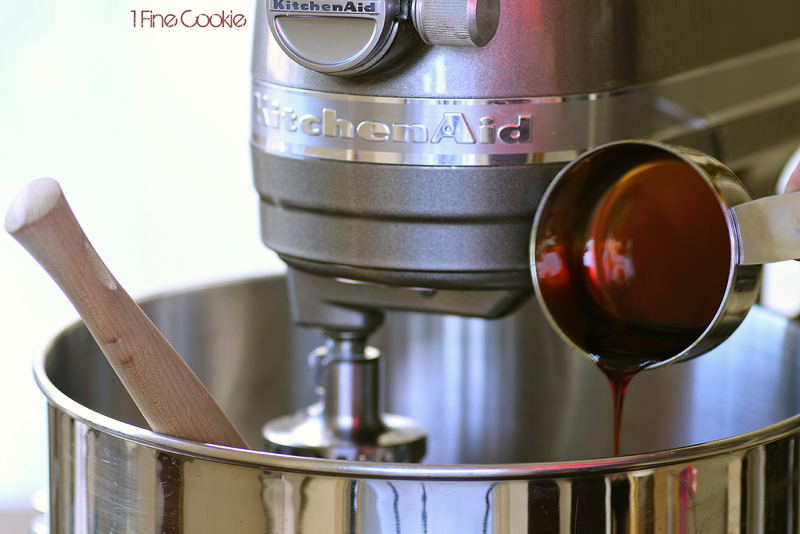 Turn up heat to medium high and attach a candy thermometer. Â Once heat reaches 238 degrees (soft ball stage) remove from heat. Pour into gelatin mixture and mix by hand to cool it down. Pour in Â rum and attach to mixer. Mix on high for at least ten minutes until marshmallow turns white and begins to firm/thicken. Scoop all of the marshmallow into a heat safe bowl and let it sit for a few minutes until it congeals. Scoop some into a piping bag and pipe onto half of the cookies. If the marshmallow firms too much, you can squeeze out the rest from piping bag back into bowl and reheat bowl for about 5 seconds. Allow to congeal again and scoop back into bag. Attach bare cookies to marshmallow cookies. Decorate! 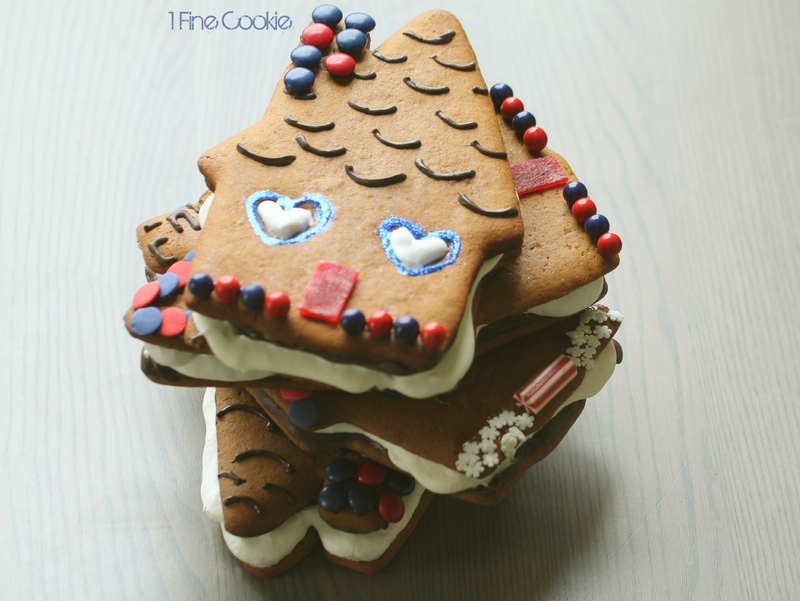 To see a collection of amazing gingerbread recipes by some very famous bloggers (omg VIP) AND enter a giveaway for lots of goodies, click here. ****If you are considering posting up photos or writing from this or any other posts I am truly happyÂ that you are excited and find my recipes interesting enough to share with others. Please see copyright standards in the footer (bottom) AND follow them!!!! In other words, 1 photo WITH credit+ link back, and do NOT copy and paste my instructions! 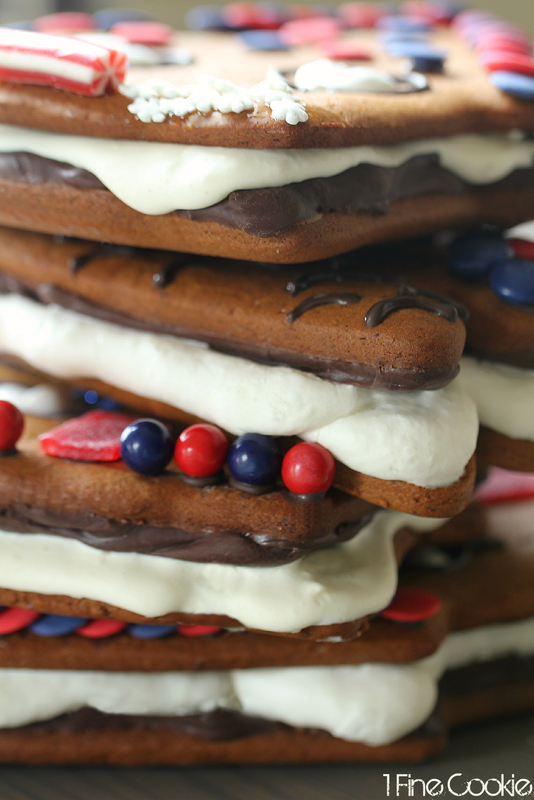 These are more than gingerbread cookies. They're gingerbread s'more houses with boozy eggnog marshmallow filling and chocolate sandwiched in between. Have your booze and eat it too this Christmas. TO MAKE THE COOKIES: Cream the butter in a mixer. Add in brown sugar and mix, then eggs and molasses. Chill dough for about thirty minutes. 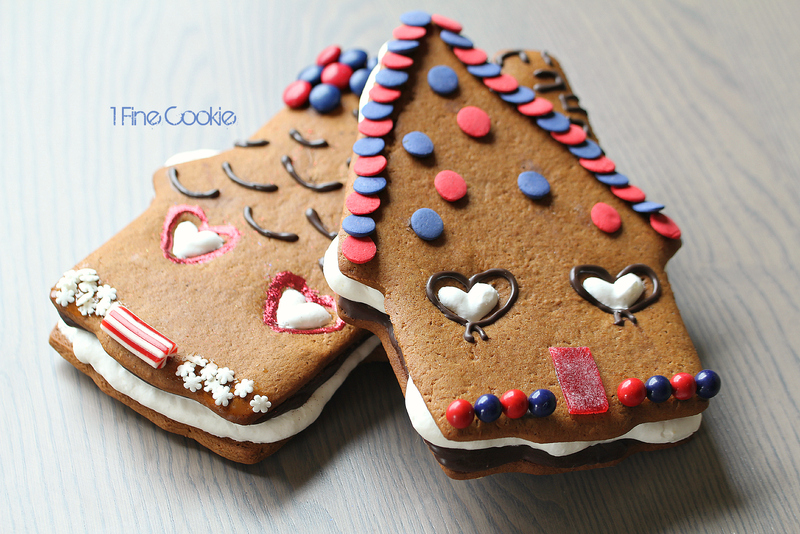 Roll out on parchment paper and use a house-shaped to cut out cookies. Flip half of the cookies so they will be able to form a sandwich. TO MAKE THE MARSHMALLOW: Sprinkle a packet of gelatin over the 5 tablespoons of cold water and 1 tablespoon cold eggnog into a mixing bowl. Allow it to soak up the liquid. 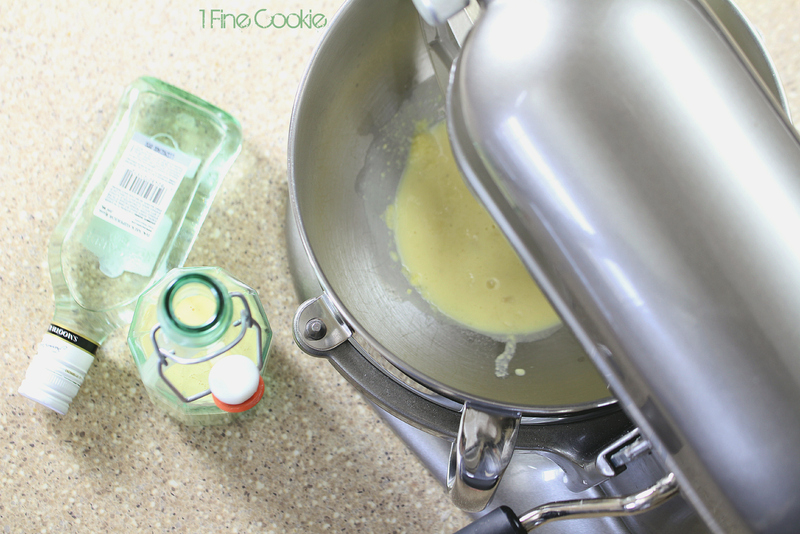 Set up a spatula, bowl, piping bag and piping tips next to the mixer. In the sauce pan pour ⅛ cup water over 1 cup sugar. Place heat on low and allow sugar to dissolve completely. Turn up heat to medium high and attach a candy thermometer. Once heat reaches 238 degrees (soft ball stage) remove from heat. Pour into gelatin mixture and mix by hand to cool it down. Pour in rum and attach to mixer. Mix on high for at least ten minutes until marshmallow turns white and begins to firm/thicken. Scoop all of the marshmallow into a heat safe bowl and let it sit for a few minutes until it congeals. Scoop some into a piping bag and pipe onto half of the cookies. If the marshmallow firms too much, you can squeeze out the rest fro piping bag back into bowl and reheat bowl for about 5 seconds. Allow to congeal again and scoop back into bag. Attach bare cookies to marshmallow cookies. What a great flavor combination. I just printed out the recipe, and if nothing else, I’m going to at least get some of those marshmallows made this holiday season. 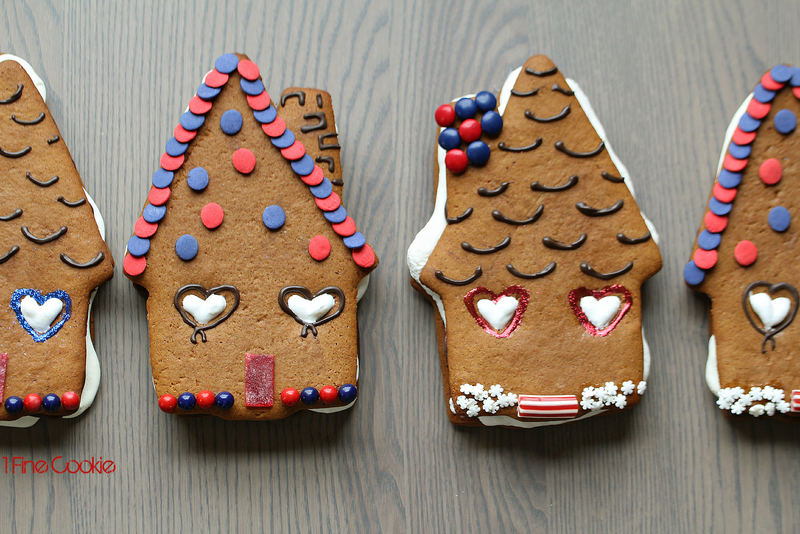 Thanks for joining in on the gingerbread fun. Oh my gosh, I love the look of these SO much! They look delicious too, with all that goodness oozing out between the cookies:). Oh my! I love gingerbread S’mores and with that added marshmallow filling… puts them over the top! SOooo darling!! And such a fun recipe. LOVE your giveaway so sign me up!!! they are really creative and so cute!